Apple has never been one to give specific details about how much content they are selling, so when I read today that an analyst with Asymco had released a new estimate of iBooks sales I was thrilled. 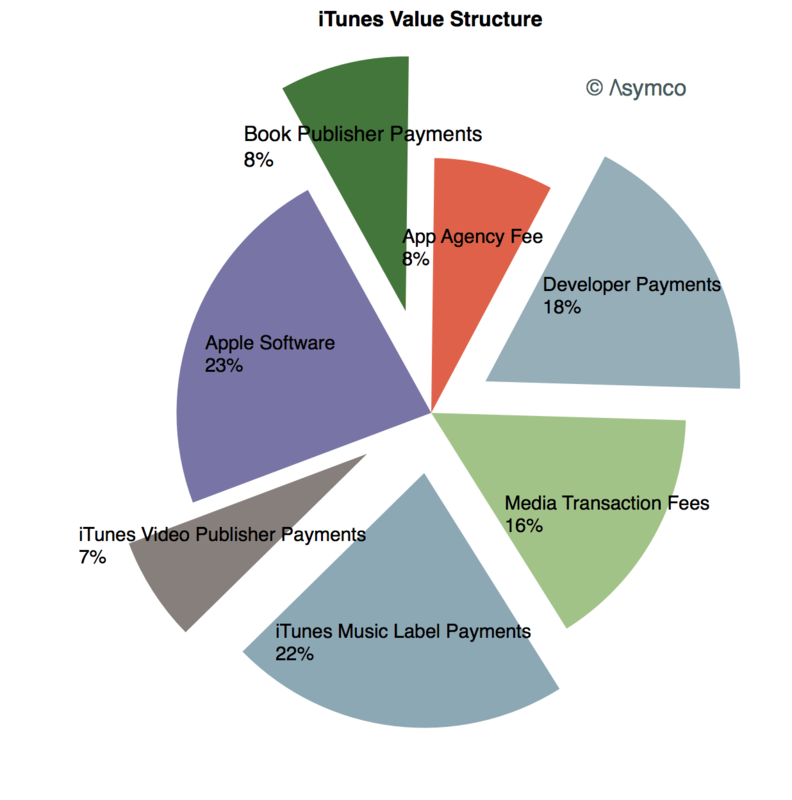 Horace Dediu has a post over on the Asymco blog which claims that apple could be earning an nearly 2 billion dollars from iBooks. If you take Mr. Dediu's numbers at face value then iBooks could be quite profitable, generating $1.8 billion in sales and about $1.3 billion in payments to publishers, aggregators, and distributors. That looks like a lot of money, but unfortunately the figure is bogus. It only took me a couple minutes to debunk it, and it turns out that absolutely none of the figures used by Mr. Dediu stand up under scrutiny. If you've followed Apple news then you know they don't announce the number of ebooks sold; Apple has announced the total number of downloads (example). That is not the same thing. Downloads includes all the free ebooks that don't generate revenue. And if the statistic I found while writing about Amazon's changes to their rules about free ebooks promotions was any sign, free ebooks outnumber paid titles by at least 15:1 and possibly as much as 100 to one (according to Smashwords). So the short of it is the billion dollar figure that Asymco is reporting today is complete bunk. And that's a shame because this was potentially a very hot story. Dammit. I forgot that about the iBookstore. It’s always DOWNLOADS, never SALES. The only reasonable way to interpret that statement is that Coker is making a within-the-same-title comparison. That is, he’s saying that, on average, a title that goes free gets 100 times more downloads than it was getting previously. You simply can’t assume that you can translate that to what’s going on at the iBookstore. You can’t jump from data about titles to data about books generally. Or vice versa. Here’s the simplest way to think about this. How many free copies of the “50 Shades of Grey” series were downloaded last year? Zero. How many paid copies of “50 Shades” were downloaded? Gazillions. I suspect that more paid copies of the “50 Shades of Grey” series were downloaded from Amazon.com than all free ebooks downloaded from Amazon. Don’t believe me? Do the math. Look up the Pew Research survey about reading habits. Estimate the total number of books read (not bought, just read). Look up the estimates for the sales of “50 Shades” in the U.S. Estimate how many of those were ebooks from Amazon.com. There’s lots of variables, but it’s pretty hard to come up with a scenario where there are more free downloads than “50 Shades” downloads. I have no doubt that the Asymco report overestimates Apple’s iBookstore revenue, but he’s a lot closer than you are. I checked by email with Mark. That stat does mean what I said. BTW, other sources put the ratio even higher than 100:1. The 1:100 is certainly true for our ebooks, apps and audiobooks – give-aways get 100 more downloads than same titles priced at $0.99, and when we put the price at $2.99 we get about the same ratio compared to $0.99. That’s because a free download is a purely emotional decision – is it worth my time to try, with a zero-sum risk. But the paid download, even at $0.99 is still a *purchasing* decision and unless there’s a measure of confidence that the book will be enjoyed the average consumer is more likely to pass than to pay even a small amount. Ok, you are a lot closer to being right than I thought. I made a stupid math error and was off by a factor of 10. This also means that very few of those downloaded ebooks get read, but the ones that do get read have a powerful effect. Yes, especially for series writers or established writers with long backlists in ebook form. Visibility is becoming a matter of levels: first you have to catch eyeballs, then mindshare, then reads, and *then* revenue. The reads might be merely blurbs, summaries, or reviews, they might be sample chapters, or they might be full free downloads. Downloads alone are going to be a poor indicator of actual visibility because of the hoarder mindset; “download first, consider later” is becoming more and more prevalent. Something new for publishers to consider. >>>How many free copies of the “50 Shades of Grey” series were downloaded last year? Zero. Picking at the nit. You meant legally downloaded. How many free copies of the “50 Shades of Grey” series were downloaded last year? Zero. Another nit to add to Mike’s: “50SoG” was fanfic that was barely changed before going into print, so copies of “Master of the Universe” (the original fanfic title) are still floating around. Simple test: does anybody believe iBooks outsells Kindle? Assuming they did, that would put Kindle revenue at $2Billion and the industry at $4Billion. Now, Bezos did say ebooks were a business worth *billions* to amazon but that was including hardware. So, no; Apple is not selling 400 million books per. Even 40 is likely a stretch because their average prices skew higher than Kindle. And Kindle average price circa 2011 was around $7. Don’t even bother with Asymco. They play in the same league as Business Insider and Digitimes. But it wasn’t until I saw this post that I knew that their analyses could not be trusted. Skewed data but a few Amazon affiliates affected byt he recent change to free books reported free download ran 98 to 99 percent of their clicks even when they featured bargain books alongside free books. This is also skewed, but most indies who are in all markets generally see 3 to 5 percent of their sales, at most, through Apple, and this in popular genres–usually series in which the first book is made permanently free. Those not using the “permafree” loss leader strategy are generally invisible on Apple. Analysts always make the same mistake of using only Bookscan/Big Five data, when even a quick glance at the Kindle bestseller lists by genre show a preponderance of lower-priced indie books. Of course, Apple’s ration of Big Five sales is much higher for a number of reasons, but it can’t have more than 10 percent of the ebook pie, even with Nook sliding badly. I’d actually put it more at 5 percent–even in foreign-translation markets, I see very few Apple sales. I wouldn’t be surprised if Amazon’s market share was more like 80 percent of the market, instead of the generally accepted 60 percent. There’s a huge beneath-the-surface market in Kindle, and a surrounding ecosystem, that simply doesn’t exist anywhere else. It is a place that analysts never see, but it has to be hundreds of millions of dollars, if not billions. Not unlikely. Especially if you go by (paid) unit share rather than dollar value. But if it exists the publishing establishment isn’t positioned to detect it or inclined to report it. The last thing they’d want to admit is that they’re not the masters of publishing.